What does "at the crease" mean? Thanks a lot! I've about had enough of you? I've almost had it ((had enough))? If referring to hockey, it's at the edge of the goal mouth. I'm thinking maybe crease in paper from having folded it. I ruined my written paper after I folded it in half because I left a crease in it. Folded it because I was in a hurry to get out of class. The paper wasn't due till the next day. I usually don't think when I'm in a hurry. Crease in the wall? Corner. Crease in the road? Curb. Crease in the first page of a bible because I folded it by accident from being in a hurry or being careless. Or crease in the corner of the page from folding it to mark the place in a book. In cricket, it means the position at which the batsman receives the ball and defends the wicket. He is "on the spot". or "on duty", or "the key player of the moment". He is "making the running". What's wrong with being in the spotlight when you know you're not a bad person. Who said anything about "being wrong" ? I'm waiting for someone to understand. I have told myself in other words. It comes from the game of cricket. Two batsmen are on the field at the one time. The one "at the crease" is waiting to receive the next delivery from the bowler. So he is the one in action at that point in the play. As an analogy, it can be used to describe someone in action, on the spot, "on the job" (no jokes necessary here), someone of responsibility. In other words, what Fresno said. I know it only as a hockey term. Ice hockey? What does it mean in that game? It means the space immediately in front of the goal, in front of the net. In cricket, the bowling crease and the batting crease are crucial to the umpire's decisions in the game. They are lines drawn precisely on the wicket. 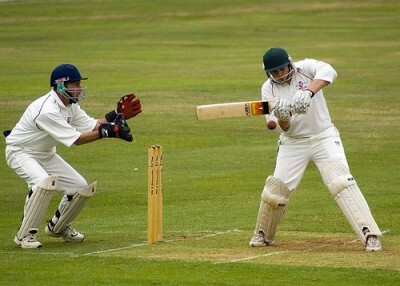 The batsman receiving the bowler's delivery stands between them, usually just behind the batting crease or straddling it. He is ready, and said to be "at the crease". The focus of the attack, for the moment, is on him. I had not responded before for precisely that reason. In hockey, one says "in the crease," not "at the crease." Therefore, as far as i can see, responses referring to cricket are correct--references to hockey are not. The crease in hockey is precisely defined, too, and the referees make decisions based on whether or not the opposing team is in the crease, and in some very restricted cases, on whether or not the goalie is in the crease. Obviously, "at the crease"does not refer to hockey. Thank you all, guys. here is the sentence"he is still at the crease, despite many appeals from his critics to sundry umpires" . I was at a total loss when I came across this sentence. “sundry umpires”, what is that?